Mark Levy has been traveling the country, bringing exciting new lecture/demonstration sessions on several topics (see below). 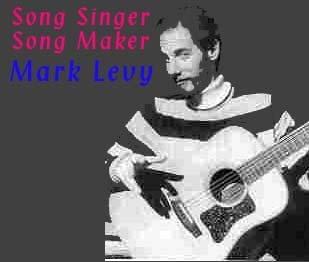 Levy brings with him rare video- and audio-tape footage of Jewish performers at their best. He also brings his guitar and dumbek drum to demonstrate the wealth of Jewish folk music over the centuries. Here are some of the topics Mark covers. These can be either one-shot or multi-session lectures. Romancero! The folk ballads and songs of the Sephardic Jews of Turkey, Greece, Morocco, Syria, and the Balkans are some of the most beautiful melodies in the Jewish tradition. We will trace their origins, and listen to live and recorded presentations. Zing-zhe mir a lidele... Yiddish folk songs from eastern Europe were described by Albert Einstein as "the most heartfelt" he had ever heard. We'll hear why in live and recorded performances of love, work, children's, and other songs from a bygone era of Jewish culture. Klezmer 101: Everything you always wanted to know.... Beginning with the turn of the 20th century, we'll listen to vintage recordings of the most famous klezmer bands and learn about the players, the rhythms, and the wedding dances they accompanied. Both audio- and video-clips of rare recordings will be presented . The Classics from Rossi to Bernstein. This class features the work of well-known and not so well-known Jewish classical composers beginning with the 16th century. We will learn about their Jewish background and listen to recordings of their stirring music. The Music of Israel: From the early Chalutzim (pioneers) in Palestine to the latest rock, we'll sample the music of the Jewish state and learn how it develops from the polyglot of settlers and musical idioms of the 20th century. To Make the World Whole: Songs of Peace, Protest, and Change Jews have ever been at the forefront of social and political movements. We will hear songs by labor, feminist, peace and environmental activists of the past 125 years, songs by Jewish songwriters which inspired others to action. Jews 'n' Jazz: Al Jolson, Fanny Brice, Irving Berlin, Sophie Tucker, George Gershwin, Benny Goodman, Artie Shaw, Dinah Shore-- only a few of the 20th century's jazz giants who were of Jewish background-- is the subject of a new course taught by Mark Levy. The course will trace the development or America's Jewish jazz singers, composers, and instrumentalists through the Dixieland, ragtime, swing, bebop, modern and post-modern periods. Hear rare recordings of these innovators and see footage from early talking pictures of their later Hollywood appearances. The class will highlight the careers of several notable Jewish jazz artists and composers beginning with their immigration to the US or Canada and their early exposure to Black jazz music. Some basic theory will be discussed, but no musical training is necessary.